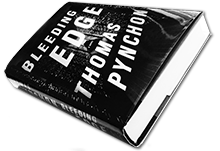 NEW: The Wiki for Thomas Pynchon's latest, Bleeding Edge, with full index of characters (with page numbers), page-by-page annotations, reviews, and lots more, is now LIVE!. We currently have eight wikis running here, covering all of Thomas Pynchon's novels: Bleeding Edge (2013), Inherent Vice (2009); Against the Day (2006); Mason & Dixon (1997); Vineland (1990); Gravity's Rainbow (1973), Pynchon's awe-inspiring third novel; The Crying of Lot 49 (1966), Pynchon's second novel; and V. (1960) Pynchon's first novel. 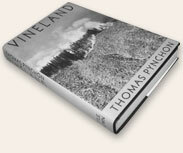 Pynchon's eighth novel, published in 2013, begins on the first day of Spring 2001, in the aftermath of the dotcom crash and just prior to the events of September 11, 2001. Perhaps a Detective Thriller but, honestly, that simply does not begin to capture this journey into the Heart of the Beast. 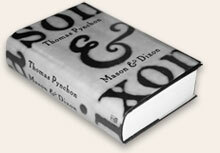 Pynchon's seventh novel, published in 2009, is described as Psychedelic Noir, but it's much more. Doc Sportello, the hippie/detective protagonist, confronts the Death of the 60s and the reassertion of Control by the powers that be. Set in 1970, it foreshadows the Internet and the loss of privacy. Pynchon's sixth novel, published in 2006, is amazing. 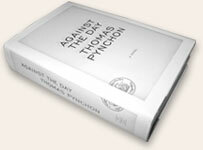 Its 1085 pages follow the Chums of Chance and many others in, around and through the world as only Pynchon can imagine it. Pynchon's fifth novel, published in 1997, was critically acclaimed and hailed as a return to form or, as T. Coraghessan Boyle put it, "This is the old Pynchon, the true Pynchon, the best Pynchon of all." 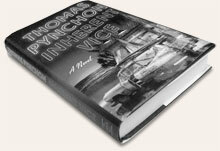 After the big wait came Pynchon's fourth novel, in 1990, and has come to be viewed as part of a California Trilogy (with The Crying of Lot 49 and Inherent Vice. Pynchon's third novel, published in 1973, is "literally indescribable, a tortured cadenza of lurid imaginings and total recall that goes on longer than you can quite believe" said the New York Times, i.e., a masterpiece. Pynchon's second novel, published in 1966, is often recommended as a good entré to his work, as it comes in under 200 pages, yet contains many of the hallmarks of his fiction.